This new generation Off-Grid product will revolutionize the Alternative energy market. It can be a Back-up system or by a flick of a switch become a complete off grid system for the home. 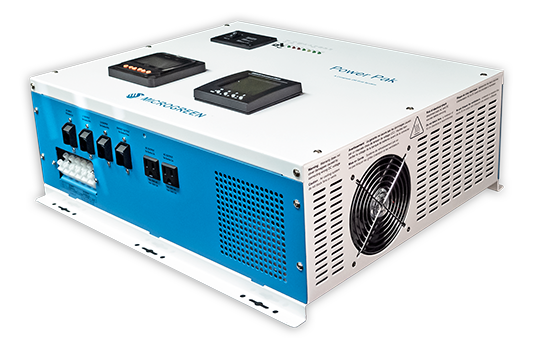 This Power Pak can operate as a backup system without solar or an off-grid system complete with solar. All the required components for an off-grid system are inside this box. It comes completely assembled and tested. It is ESA inspected. This unit is extremely easy to install. This is an excellent DIY product. There are two receptacles on the system, allowing the user to have instant AC power after connecting the batteries. The Power Pak was designed to be sold as a Microgreen kit (complete with panels and batteries) or as the Power Pak only. Batteries and panels can be purchased from another source. This remote access with a Power Pak will create a smart cottage. There is a phone app or a webpage allowing the user to access and control the Power Pak. This app allows the user to see the status of their system and control devices like a fridge or furnace fan remotely. The app has two built-in calendar reminders. These reminders allow the user to set an alarm, as a note of what they need to bring back to the cottage. If an alarm occurs on the Power Pak, it will notify the user's phone with an updated status. This status will show the DC volts and amp readings. The AWS cloud records ongoing data. By scrolling back through this data, any previous alarms will show. This system operates from a 24 volt DC battery bank. The system will accept either AGM or flooded batteries. Flooded batteries must be mounted inside a box in order to vent outside any fumes that occur during the operation. The system can accommodate either 2-12 volt or 4-6 volt or 12-2 volt batteries when operating the Power Pak. The size and voltage of the batteries will determine how much storage the system can supply. Each of the mentioned configurations is considered a group. The Power Pak can charge a maximum of 5 groups of similar type batteries. The kit consists of a 4 kW Power Pak along with 2-285 watt CSI solar panels, 4-12 volt 108 amp/hr AGM batteries complete with the approriate battery cables. The kit also includes 2-20 ft lengths of MC4 solar wires and connectors, 20 ft of bare copper ground wire and a ground plate. All of these items together make a complete off- grid system. The only thing required is the mounting hardware for the solar panels. Many options are available.